This letter was written by Terri in Vacaville, California. She is one of our customers and the mother of a child with autism. Her letter was published in her local newspaper. Like I shared in my previous article, I have a 12-year-old autistic son named Luke. As I’m sure, most everyone has some type of experience with twelve-year-old boys; I can assure you that Luke is probably very different from what you’re used to. He has very limited language, and his basic skills are grossly deficient in comparison with other kids his age. In regards to Luke, our family has struggled with experiences that most people could never envision…. but that’s another story!! Anyway, when Luke was smaller, we used to take him on bike rides with one of those little trailers that go on the back of the bike. That was one activity that he loved to be a part of. Since he’s gotten older, and almost as tall as I am, the trailer just was not working for him anymore. We tried to put him on a large, three wheel type bike, and since he was the one who has to make it go by himself, he refused to do it. On any given weekend, we were taking our other three children on bike rides, and leaving Luke at home with a care provider. It was heart breaking to have to do this because Luke would have really liked to come along, but we just didn’t have the means for him to take a bike ride with the family anymore . . .
That’s when I started doing some research on the internet. 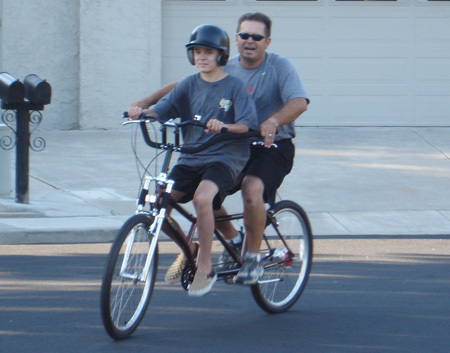 I found a specialized tandem bike that was made especially for children with developmental disabilities like Luke’s. After discovering that the bike was $1000.00, I called our local assemblywoman, Lois Wolk to ask if there was any service-type organization that may be willing to donate a bike such as this. Her office staff was very helpful in referring me to the Vacaville Sunrise Rotary Club. The following week my husband and I were invited to a breakfast meeting with the Rotary Club, where they gave me the opportunity to speak about my son, Luke. It was decided “then and there” that the Rotary Club was going to purchase this bike for our boy and give him a shot at experiencing a simple childhood pleasure that most of us take for granted. My husband, Abe, and I felt a little heartsick the first time we put Luke on the bike. On his first experience, he tried to hop right off almost as fast as he got on. He was dragging his feet on the ground and screaming. I guess it’s true with just about any child; things don’t always go as smoothly as we envision. Anyway, the second time Abe rode our son around the court, Luke was actually riding…. Screaming, but riding! ☺ On that particular day, after taking our screeching child around the cul-de-sac, Abe decided to take our three other children for a ride. He set up the trailer for our little guys, and our ten-year-old daughter had her bike ready to go. Luke came outside and acted like he wanted to go. 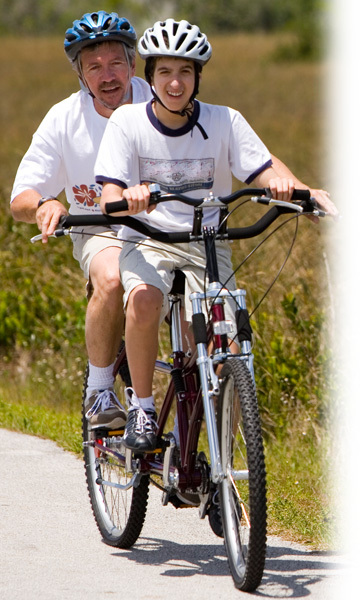 I told him, “Luke, your Daddy just tried to take you and you were screaming the whole time…So the next time we take a ride, you need to ride on your bike.” Luke and I watched the family disappear down the court. As we walked back to the house, I pointed to his new “Buddy Bike.” “See…that’s your bike right there,” I told him. Luke ran over to it and started to hop on. I know that seems like small potatoes to most, but that is the first time Luke has ever tried straddling a bike on his own. Yesterday Luke rode all the way to the end of our block and back…and didn’t even scream. It just takes some getting used to for him, but I am convinced that this will be a favorite activity for Luke. I can’t tell how you thankful we are for these acts of kindness. We are truly grateful to the Vacaville Sunrise Rotary Club for such a generous donation. Yesterday, as I was watching my husband ride down the street with Luke, the feeling was the same as….Sea Biscuit crossing the finish line…..it was the same as the ending on most any Disney movie out there….That feeling that makes you feel like you might just burst from happiness… That’s how I felt watching my son fly down the street on his new bike. It was as if the Lord just scooped me right up and plunked a big wet kiss on my cheek. Small potatoes to most, but to our family, it’s huge! …And I couldn’t wait to tell someone! !